My portable workbench with new banner clipped on, ready for the demo. 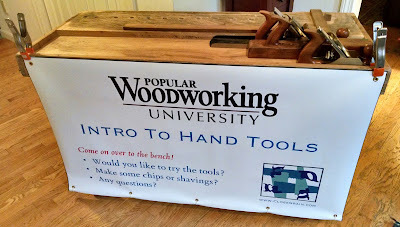 I'll be demonstrating at two Lie-Nielsen Hand Tool Events coming up, promoting my Popular Woodworking University online course Intro To Hand Tools (a full episode guide to the 12 hours of video instruction is here). I'll also have my current assortment of greenish luthiery stuff as I practice the techniques for building violins by hand. Come up to the bench, try out some of my tools, bend a violin side. The first event is this coming Friday and Saturday, November 13-14, at Shackleton Thomas Furniture, in Bridgewater, VT. Details here. The second is December 4-5, at The Furniture Institute Of Massachusetts, in Beverly, MA. Details here. If you've never been to one of these, they're great fun. Lie-Nielsen has all of their tools available to try out, with skilled staff to answer questions and provide on-the-spot instruction. The other great thing is that they invite local regional woodworkers and toolmakers to demonstrate and sell their wares. This is a great opportunity for hand tool enthusiasts to meet and hang out and make some shavings. And of course buy some great tools! Steve, Look forward to seeing you at the Beverly show - it's been a long time!